The 2015-2016 season has been one of, if not the best, seasons in our clubs history! - Our boys brought home their sixth straight state championship and competed at new heights. - The girls grew in numbers and skill, and are primed to solidify themselves as a key piece of the program's future. - The club's restructure to a formal non-profit with a board, broadening of volunteer opportunities, and formalized coaching positions were successes and allowed for an enormous amount of learning organizatioally. From the founding of our club in 2007, to the present day of 2016, CGUC has always been an organization by the people and for the people. CGUC is and has been an organization that has grown itself from the ground up through the contributions of players, parents, and volunteers who are passionate about our mission and the awesome sport that is ultimate. We know that our community is filled with talented and experienced people who want to get involved, in whatever ways are right for them. As such, the board wants to always be sure we are tapping in to the multiple perspectives and supporting families we have in this club. This feedback survey is a key way of doing that. Please use this survey to give feedback on some key items and to make suggestions. The more information you give, the more potential there is for us to shape the club with your influence. Each suggestion in the survey is simply for keeping our minds open, and to gain information, and not necessarily something that we will implement. Additionally, some board positions and chair positions will become available for the 2016-2017 season, in the months following our end of the year banquet. Keep your eyes open for any announcements regarding getting involved in those ways! There are several things we would like to implement for our club. Many of them are listed below, and all of them require time and resources. Of the things listed below, chose whether or not you think it is worth the cost/benefit. YES - More expensive, but special for the players NO - Much cheaper, club would use the same jerseys every year, to allow for returning players to not buy new jerseys each year if old ones still fit. Allowing families and players to balance Ultimate with work, school, and other sports/clubs is important to us. As coaches, we try to hit the right balance of required commitment without forcing kids to specialize at too young of an age and without causing them to miss other important parts of high school (good grades, work experience, other clubs they also enjoy). As our club continues to grow and become more competitive, it's important to us we get feedback in this area. 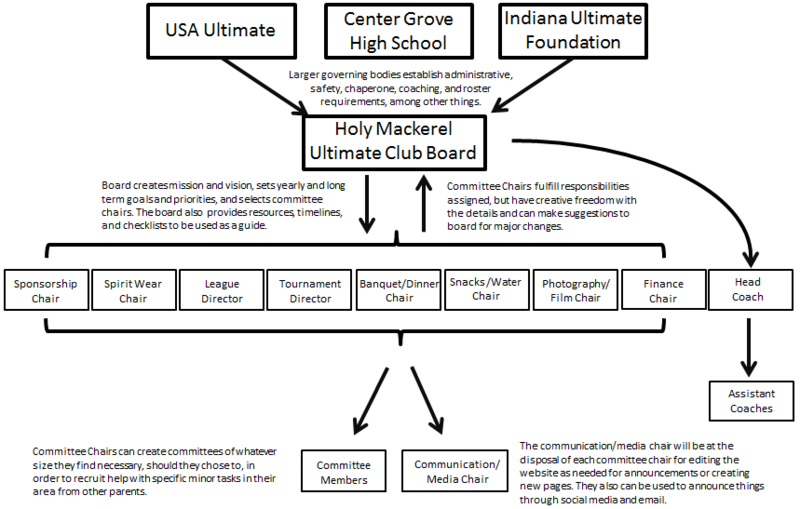 While we are partially limited by the available competition in Indiana, most of our clubs' coaches work to develop Ultimate in several areas beyond Center Grove specifically, and where we focus our outside efforts to develop the overall local ultimate community has an impact on our club as well. One potential project being considered (early stages) by leadership (not exclusively or necessarily our own coaches) is forming weekly home and away games in the fall and/or spring against other schools - mimicking structures some more developed states have began to have. This could be in place of or in addition to the traditional tournament format, and what we value as a community more may slowly shift things over the next several years. Below is a rough overview of the current club structure. ​Checking the boxes above does not commit you in anyway, but helps our club get a feeler for the interest level in each position. Applications/sign ups for each role will be available on our website and emailed out to club members and parents. If you were a volunteer chair or board member for this past season, and have any lengthy feedback you would like to offer for your role's work, feel free to type and attach any notes using the links below. Alternatively, you can email feedback notes concerning your role to centergroveultimateclub@gmail.com. Furthermore, if you made any new resources (tables/flyers/information/etc) please attach those files below so that the club can add them to our files and the Resource Manual, so that we can continue improving and building on the resources we have for each role. Please use this space to offer any suggestions to our club, whether small or large, that you think could improve the overall quality, success, size, and/or ease of the club. Completely new ideas, thoughts, or constructive changes that you think could be made in certain areas are more than welcome.